International Open Access week – Where can I share my research data? We get asked lot of questions about where to publicly share research data that underpins your publications. Your subject area may have a default ‘go to’ subject repository, however, where the choice is not so obvious this simple diagram can be used to help identify a suitable repository. 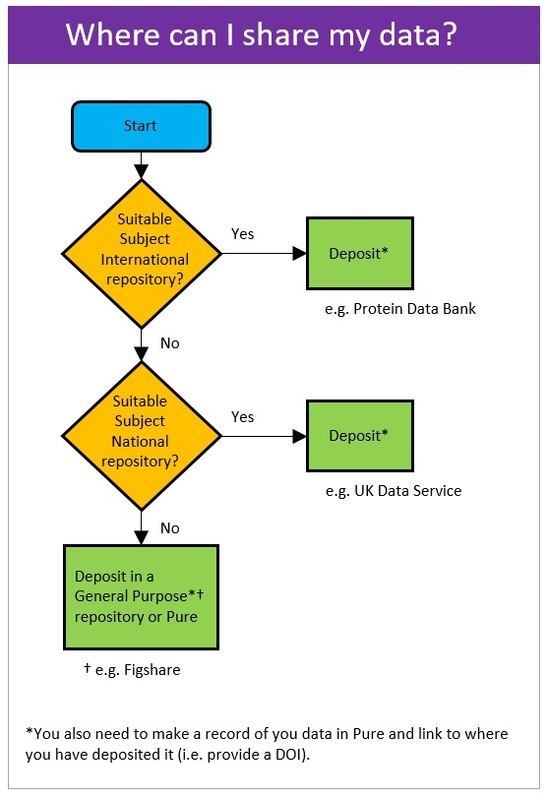 You may ask the question ‘Can’t I just deposit my data in Pure?’, to which the answer is ‘Yes’, however, there may be more suitable international / national repositories that are better able to raise the profile of your data, so they should be your first choice. You may also want to consider the option of publishing in a data journal, providing a detailed description of your dataset to promote and enable its re-use. Be aware that your funder or publisher may require you to deposit your data in a specific repository. Don’t forget to add a data availability statement (ie. with a link to where your data is deposited) in your publications so that people can find your data! For further help please see the University’s Research Data web page, the 1 page research data checklist’ or contact researchdata@port.ac.uk with any questions.